Tropical Storm Bavi continues to move across the Pacific and is now affecting the Mariana Islands. The system was last located approximately 200km east southeast of Saipan or about 300km east northeast of Guam. Maximum sustained winds are at 85kph with gusts of up to 110kph. TS Bavi is moving west northwestward at 30kph. The National Weather Service has issued a Tropical Storm Watch for Guam, Rota, Tinian, and Saipan. Residents are warned for the possibility of strong winds of up to 80kph. Rainfall accumulations of up to 100mm and wave heights of as much as 10feet are possible through the next 12 hours. Please coordinate with your local officials for the latest warnings! 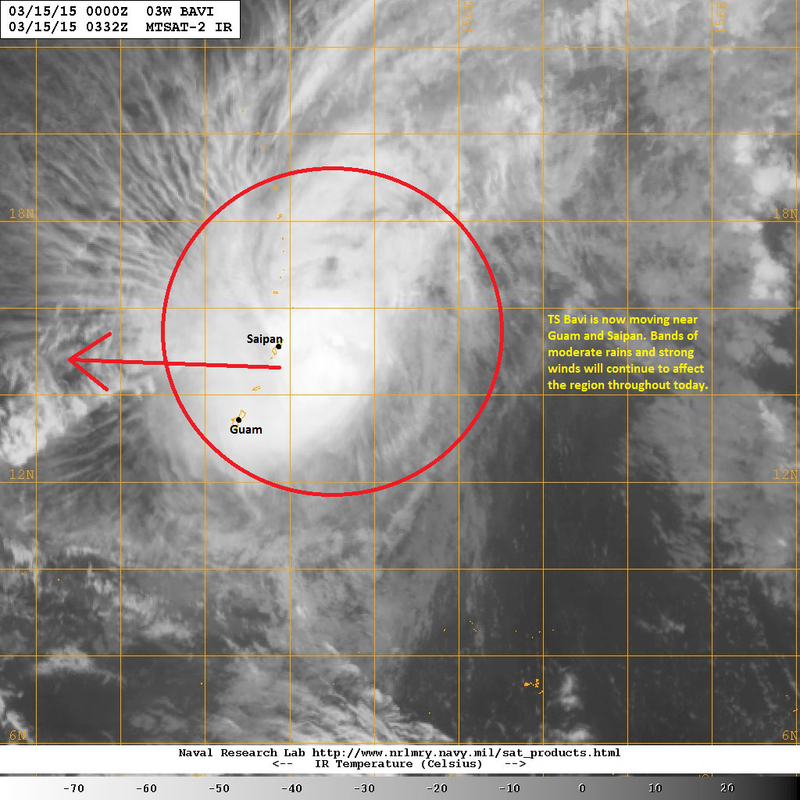 Latest satellite image shows Bavi is still dealing with moderate to strong wind shear. Convection remains strong but is also continuing to be sheared to the western half of the circulation. Despite the weak nature of the storm, Bavi is still forecast to bring unsettled and unsafe weather conditions across Guam and nearby islands. 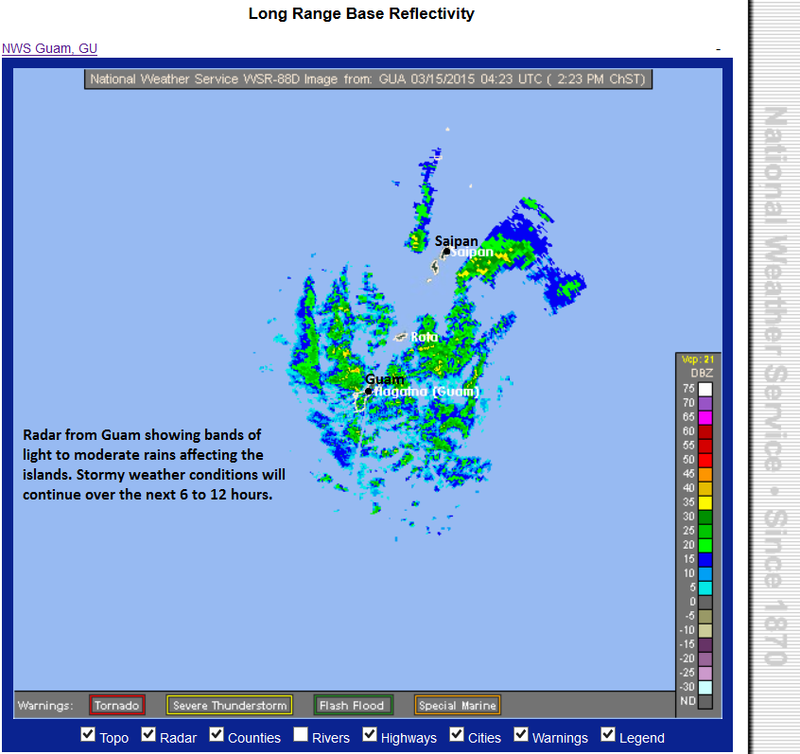 Latest radar image from the National Weather Service in Guam shows bands of light to moderate rains beginning to impact Guam and parts of the Mariana Islands. We expect anywhere from 50 to as much as 100mm of rainfall accumulations in the next 6 to 12 hours. Rains should subside by tomorrow morning. Tropical Storm Bavi will then continue moving westward across the Pacific and could enter the Philippine Area of Responsibility. 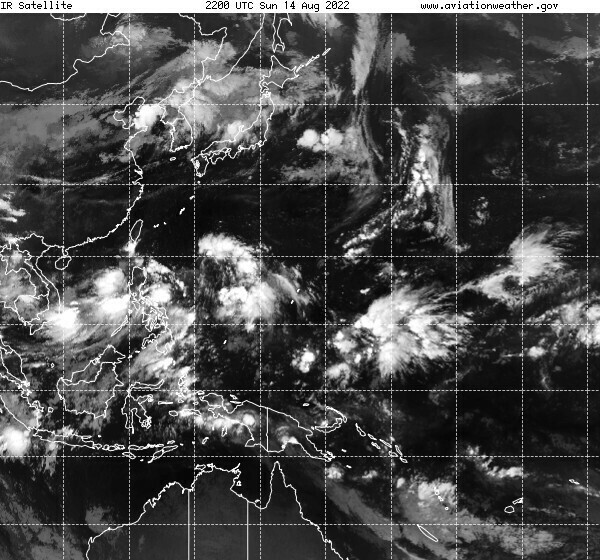 PAGASA will assign the local name 'Bagyong Betty' once it enters the PAR sometime around Tuesday. Right now, we don't think Bavi will intensify much as it moves towards the Philippines. However, the possibility of a Tropical Storm landfalling somewhere in Luzon or Visayas is likely late next week. We'll have another update later tonight.